On the heels of their just-released critically acclaimed fourteenth studio album, This House Is Not For Sale, Island/Mercury will celebrate the band's legacy with a career-spanning 17-album vinyl box set featuring every Bon Jovi album from the past thirty-two years remastered on high-quality, 180-gram vinyl. The 25-LP collection will be available in February 2017 and include every studio album from their eponymous 1984 debut to 2016's This House Is Not For Sale. 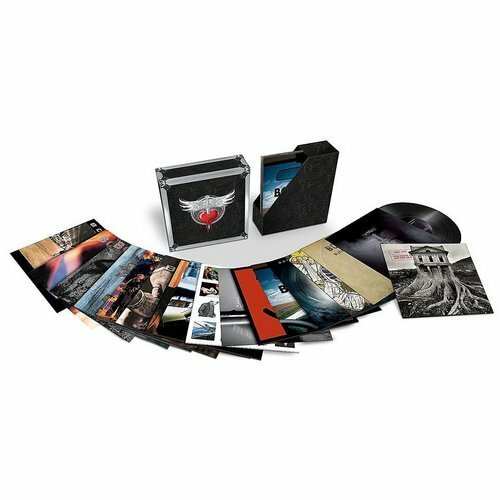 The comprehensive collection will also include both of Jon Bon Jovi's solo albums, Blaze Of Glory and Destination Anywhere, as well as Extras, a new compilation created exclusively for the box set which features fan favorite 'Always' along with hard-to-find international rarities. Each vinyl album preserves the original look and sound of the originals - all LP jackets are exact replicas of the original album cover and songs have been mastered to the band's specifications to ensure exceptional audio quality. 5. Keep The Faith (1992) first-ever vinyl pressing in the U.S.
Well that's extremely annoying! In the last two files (about 80% of it finished), the package is kicked by TurboBiT! ... and you know how long 3 GB in free mode take at about 50kb / s rate. Is it possible to fix the package from the old state so that I can only reload the two broken ones? Would be a great thing! Many thanks in advance for the effort and the rest of the team: Thank you for the good work here!! !